I had already heard good things about My Everything by Katie Marsh so when this landed on my desk I wanted to read the book there and then. Finally I have and it is a beautifully written thoughtful novel. Marsh writes with such tenderness about a subject that she has painstakingly researched and put together a novel that you will find very difficult to put down. The ultimate page turning novel packed full of emotion but at the same time uplifting. On the day Hannah has decided that this will be the day that she ends her marriage to Tom by telling him she is leaving him, something terrible happens that will change their lives forever. Tom is a workaholic and seems to spend more time in the office that at home, and when he at home Tom is forever criticizing Hannah and after another drunken late night row, Hannah has made up her mind she is going to leave Tom and get away, but she will need to decide when that will be. Hannah wakes up to find Tom not in bed but lying on the bedroom floor, she thinks he is drunk after another drunken late night, but Tom is not drunk he is paralysed on the floor. The Paramedics are called and later in hospital it is confirmed that Tom has had a stroke at the age of only 32. Hannah’s plans to tell Tom she is leaving all falls apart and she is riddled with guilt, what does she do now? What is to become of their lives, their marriage? All she wants to do now is look after her husband in sickness and in health after that was their marriage vows on their wedding day just a few years before. Their story is mixed with flashbacks to the past and the present. Hannah’s dreams are now shattered and now the pair have to try and rebuild their lives, truth is can they, does Hannah want to stay or is it time for them both to move on, what will everyone think if she now left Tom after his stroke. There is guilt in this story. I loved the characters in this story especially Tom’s errant Sister who at first you take an instant dislike. Note I said at first. But all their friends bring something to the story that adds to its depth and warmth. My Everything is a s story that reminds us of how fragile our lives are, what we have and hold so precocious and sometimes we take for granted can change at an instant and with that our lives can change forever. So do Tom and Hannah make it together you will need to get yourself a copy of My Everything and settle down to a read you will not forget. 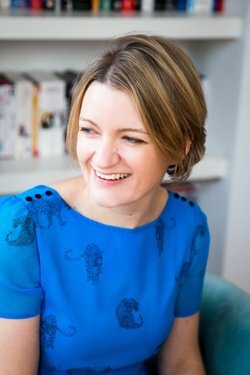 Katie lives in South west London with my husband and daughter, who are locked in an ongoing turf war with my ever-expanding book collection. As well as writing novels I work in healthcare, and my first book was inspired by the bravery of the patients I met while working in stroke services. It’s called ‘My Everything’ and is about a young woman – Hannah – whose husband Tom has a stroke on the day she’s going to leave him. I really hope you enjoy it. When I’m not working or writing my next book (currently a large pile of Post-its), I spend a lot of time in local parks trying and failing to keep up with my daughter’s scooter. I love mojitos, afternoon cinema trips, stealing my husband’s toast, karaoke (in my head I AM Cher) and adding cheese to absolutely all of my meals. 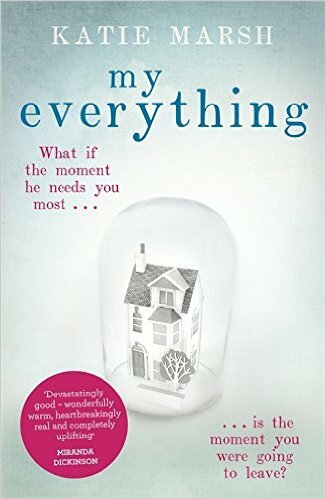 My Everything is Katie’s debut novel and was published by Hodder on 27 August 2015.